We hear about the Passion story at church. We read about it. But what would it be like to experience it? Invite your church and community to Journey to the Cross. This outreach and educational event encourages children and adults to walk the path that Jesus walked---and to experience the joy of Palm Sunday, the disappointment of Judas’ betrayal, the devastation of the crucifixion, and everything all the way to the jubilation of the resurrection. Details come alive as connections are made through touch, taste, and action---creating aha moments participants won't forget. For example, at one station, participants receive a dab of perfume from Mary at Bethany as she tells them about the anointment of Jesus. "We are so used to just a little spray of perfume. But then you realize that Jesus had an entire bottle broken and poured on His feet and that it's likely He carried that scent with Him into the crucifixion,” says Kelly Bailey McCray, author of Journey to the Cross. “This gives you a deeper understanding when Jesus tells the disciples that the woman has anointed Him for burial." The planning guide provides instruction on having up to 13 stations, or as few as 9. The program is very flexible. It can be presented as a single event, or it can be spread across days or weeks, with a few stations experienced per event. Re-enacting Jesus' Palm Sunday entry to Jerusalem by waving palms and shouting, "Hosanna!" Tasting Passover foods and learning about the Lord’s Supper. Praying with the owner of an olive garden who tells about the Garden of Gethsemane. Touching a crown of thorns and seeing a whip to imagine the true pain of Jesus’ trials and suffering. Listening to an angel and Mary, wife of Clopas, report about Jesus’ resurrection. By hearing the Passion story in a different way, by experiencing Jesus’ journey to the cross, you, your church, and your community gain a new and deeper appreciation of Christ’s death and resurrection. "This kind of experience uses all of the senses to give you a better experience and understanding of the story," says McCray. "You see a whole new aspect of the biblical account that you think you've known for years." 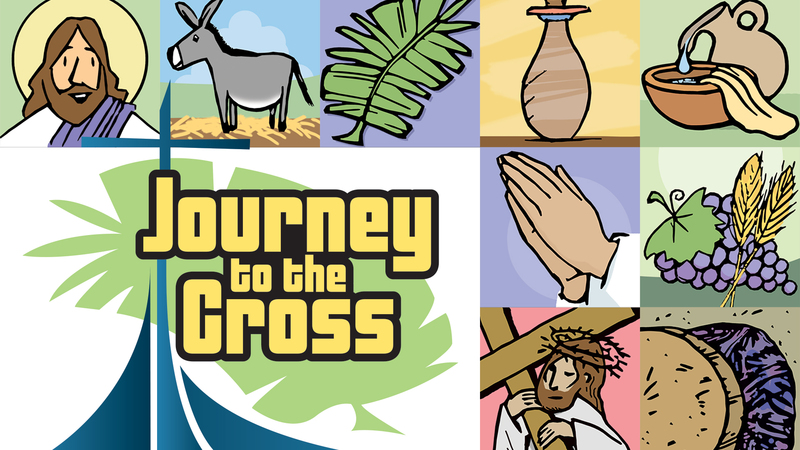 Journey to the Cross is easy to adapt for a variety of groups: Sunday School children, Day School groups, youth groups, and adults. It works well with special interest groups, such as a senior citizens, women, and youth. You could easily adapt it for use by people with special needs. Even better, use it for cross-generational groups or families where adults and kids learn from one another. Invite your middle school and high school students to lead the younger children through the stations. Invite neighborhood families and friends to experience the Gospel in this engaging outreach event. Journey to the Cross has something for everyone, no matter how large or small your congregation, no matter how many people experience it, no matter how young or old your participants!